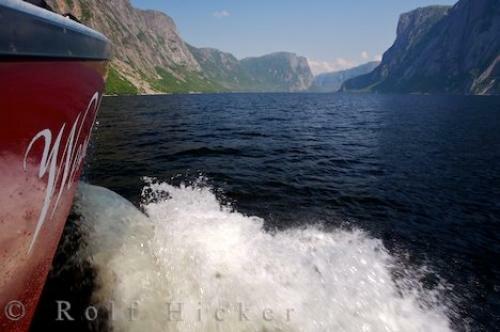 The 16 kilometer long Western Brook Pond, situated in Gros Morne National Park on the Northern Peninsula of Newfoundland, is best explored by tour boat. From the comfort of one of the two boats operated on Western Brook Pond (Westbrook II or Westbrook III), it is possible to travel to the extremities of the lake while taking in the stupendous scenery and listening to the interesting, live interpretation of nature and history. Picture of Western Brook Pond in Gros Morne Naional Park in Newfoundland during a boat tour of the lake.